The Parador of Aiguablava is closed until mid 2019. 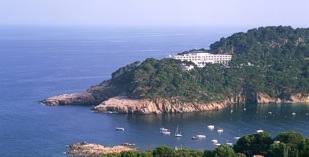 If you wish to stay in Begur during this period we highly recommend the Hotel Aigua Blava. This modern Parador is a superbly located hotel on the Punta D'es Muts and is surrounded by pine trees overlooking the sea. This is the perfect place from which to enjoy the beautiful beaches, cliff walks and explore the coves in an unsploilt, natural environment. Under the tantalizing lights of the Mediterranean, the Parador Aiguablava offers its guests a high level of comfort and service both for the individual customer and for business meetings. There is a gymnasium, swimming pool, sauna and bedrooms with beautiful panoramic views of the sea. The restaurants of the Parador group hotels all serve regional dishes and have a gluten free menu. The regional specialties of this Parador are based on the "ampurdanesa" style of cooking which has a strong coastal influence and sometimes makes use of unusual ingredients such as sea urchins. "Suquet de Peix", sea food dish in a sauce; Another tasty local specialty is the dish of chicken and lobster. During the summer you can enjoy this wonderful cuisine by dining on the beach in a superb, natural environment. Explore the village of Pals as it boasts a Romanesque-Gothic collection of monuments. Visit the museum (and former house) of Gala-Dali in Pubol and the medieval fortress located in the centuries-old village of Peratallada which is located near Aiguablava. During the summer months there are numerous concerts and festivals in the various towns in the locality, Calella, Palafrugell etc. Alternatively, you might like to use a disguise and participate in the carnival in Palamos which is held in February. the caves of Aiguablava, mountain biking, horseback riding, parachuting, flying micro light aircraft etc. If you like wildlife, visit the birds reserve of the Aiguamols National Park. The Parador of Aiguablava has sixty one twin bedded rooms, ten double bedrooms, five suites and two easy access bedrooms. For the comfort of guests the Parador is air conditioned, has heating, piped music, a gift shop, a restaurant, bar, conference facilities, parking (without security and limited places), garden and wireless Internet in some areas of the Parador. The hotel also has gymnasium, sauna, seasonal swimming pool, currency exchange and lift. Distance from the nearest airport is approximately 150 kms, train station is 26 kms away and the nearest port is 150 kms away. The 'Mar i Vent' restaurant has a seasonal closing period. Pets are not allowed. The Parador of Aiguablava is closed until mid 2019. Incredible setting. Everywhere you look you see the Mediterranean. Building has an LA 60's vibe, not historical like some other paradors, but lovely just the same. We stayed here 10 days and didn't want to leave. Attentive staff. Huge buffet breakfast; was able to forego lunch altogether. Rooms are simple, could use a little updating, but in perfect order. First time to Costa Brava and very relieved we chose this location, as parts of the other area are built up - high rise hotels, etc. Natural setting with walkable small coves for swimming. Small town of Begur charming; lots of restaurant choices. Used pool area and Aiguablava beach just below parador extensively, and always in order. Beach gets busy on weekends. Friendly reception, nice room with terrace and view on sea, gorgeous view from garden but it was a pity you can't dine outside. Not enough parking places. beautiful walk to small beach nearby. Very nice room. Gorgeous view of the sea. Excellent breakfast in sunny and open surroundings. Staff was very helpful. Good outdoor patio to enjoy an afternoon drink. Parking is a little difficult. If you want to eat elsewhere there are good restaurants a short drive away. Nearby I recommend the gardens at Cap Roig, the small beach towns such as Parafrugell de Calella and Tamariu. FGirona is an easy day trip and not to be missed. My wife and I had a four day stay over Xmas which was perfect. Reception staff, Bar Staff, Restaurant Staff all exceptional. All evening meals taken in the hotel from superb menu. Lunchtime bar meal on the terrace with view also recommended. Room with splendid view also overlooking the bay and out to sea quite magnificent. We shall be returning next Xmas. 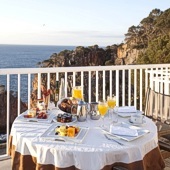 The Parador hotel of Aiguablava is on a rocky promontory jutting into the Mediterranean Sea.